The elk herd is doing great. The population is growing with about 17 calves are predicted to be born this spring, according to Wisconsin Department of Natural Resources (DNR) Wildlife Biologist Kevin Wallenfang. “There are about 60 elk adults presently in the Jackson County region, expected to increase to about 75 total this spring,” Wallenfang said. Ho-Chunk Nation Wildlife Biologist Nelson Smith is one of the wildlife biologists responsible for monitoring the movement of the elk by means of telemetry and Global Positioning System (GPS) collars. Smith said that some losses are expected in the first years until the elk establish themselves in their new environment. It appears they have turned that corner, he said. The Jackson County elk reintroduction is a joint effort that includes the Ho-Chunk Nation, the Wisconsin DNR, the Jackson County Wildlife Fund, the Rocky Mountain Elk Foundation, and Jackson County Parks and Forestry. The Jackson County herd is one of two elk populations in Wisconsin. The other herd in the Clam Lake area, which is in northern Wisconsin. 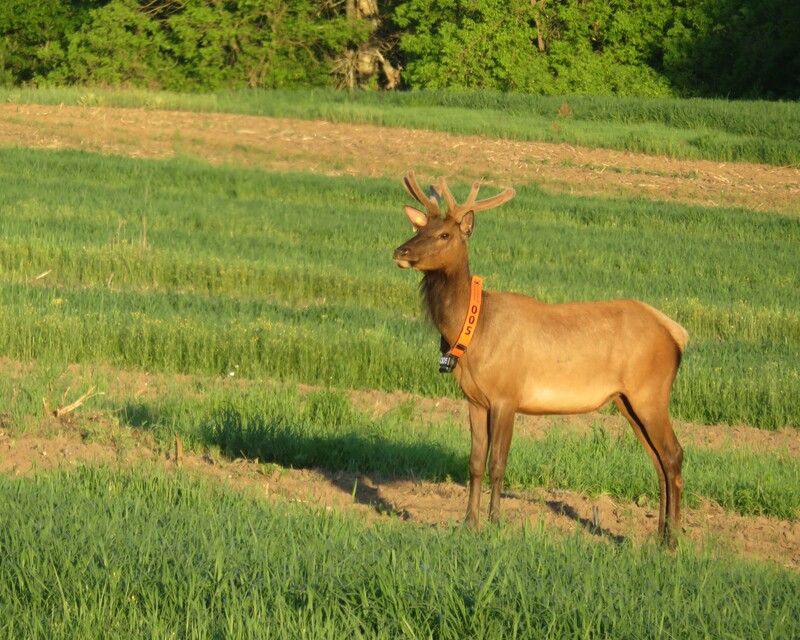 Recently, on April 3, the Clam Lake group received an additional 48 elk from Kentucky. The current herd consists of about 200 elk in Ashland, Sawyer, Rusk, and Price Counties. Elk are native to Wisconsin but were extirpated during the 1800s. Early reintroduction efforts in the 1930s failed. The last native Wisconsin elk was killed in 1948. The Ho-Chunk Nation has been a proud partner with the Wisconsin Department of Natural Resources (DNR) to bring elk to the Jackson County area. In 1989, the Wisconsin DNR was directed by the state legislature to explore the feasibility of successfully reintroducing elk, moose, and caribou. In the end, it was determined that an elk reintroduction effort could succeed, while reintroductions of moose or caribou likely would not. In 1993, the Wisconsin state legislature authorized the University of Wisconsin-Stevens Point (UW-SP) to evaluate the potential for reintroducing elk to the Great Divide District of the Chequamegon-Nicolet National Forest (CNNF) near Clam Lake. In February 1995, 25 elk were trapped, held in a quarantine facility while undergoing disease testing and transported to the Clam Lake release site. After being held in a pen for an acclimation period, the elk were released into the CNNF on May 17, 1995. The Wisconsin DNR struck up a deal with the state of Kentucky DNR to obtain some of their elk. They had a thriving population of more than 15,000 of the species and agreed to allow Wisconsin to transfer some of those elk. Since the animals have no cases of Chronic Wasting Disease (CWD), there was no danger in introducing CDW to Wisconsin wildlife. According to the Wisconsin DNR, the long-term goal is to increase the herd size to 1,400 elk in the Clam Lake area and 390 elk in Jackson County. Jackson County received its first 28 elk in 2015, with 75 going to the Clam Lake herd. Jackson County later introduced another 46 elk to the group. Part of Smith’s job is to monitor the Jackson County elk. To do so, each of the adults was fitted with Global Positioning System (GPS) collars so they could be located by satellite. As the young move into adulthood, they, also, are fitted with GPS collars and every so often the adults have to be trapped and updated with collars having fresh batteries. Smith can see on his computer their positions, which updates every 13 hours. Each elk position is noted and placed on an update sheet. The newborns, on the other hand, are instead fitted with smaller collars that transmit radio signals, Smith said. Once fitted, the young can be located with antennae by means of radio telemetry. Getting a collar on a newborn elk involves a lot of manpower in the form of ground searching. When a female leaves the herd for an extended time, it indicates that she is preparing to give birth and is looking for a safe place. Smith makes note of the new location and then will deploy a crew of searchers within two or three days after the estimated birth. When the ground crew finds the newborn, it usually will lie still and not move even when touched. At that time a radio collar is attached and they insert an almost inch-long bar code under the skin at the neck. This allows the animal to be positively identified in the future. The number of the mother of the newborn also is recorded into the data. Calves are usually born in May or June, but they can extend into months as late as August. A late-birth calf has less chance of winter survival because it has had less time to grow and build up reserves of body fat. Springtime is the best time for calves to be born because then new, fresh growth is available for foraging. “We have an almost 100 percent survival rate of newborn calves in Jackson County,” Smith said. Wolves have not been a factor because the wolf packs are small in size, usually four animals, so they usually don’t concentrate on the elk. Also, there are plenty of whitetail deer to provide easier prey to the wolves. Wolves are more of a factor in the Clam Lake herd, he said. Although the numbers of elk are less than the original introduction amounts, an initial 74 elk and now at 60, the success has been pretty good. After the initial introduction, 10 elk have been killed. Two were hit by vehicles and six killed by other means. In July, 50 more elk were released, but four have died, two from unknown causes, one from a bacterial infection and another one from a broken leg. This last fall, two elk were killed when hunters who mistook the animals for whitetail deer. Any collar, GPS or radio, will give send a signal when no movement has been recorded in four hours. If that happens, it is assumed that the elk has died. Every day, Smith records each elk’s location, each with a specific GPS identification number. The ultimate goal in each herd is to build up the population large enough to allow hunting. That goal was achieved last fall in the Clam Lake group. About five percent of the herd was offered to be harvested. Ten tags were given out, with five of those provided to Ojibwa tribal members, one to the Rocky Mountain Elk Foundation, and the remaining four to Wisconsin residents in a raffle drawing. The last group of 48 elk brought up from Kentucky on April 3 to the Clam Lake group will probably be the last for a while. No other plans of acquisition are in the works. “We’re hoping they will stick,” Smith said.